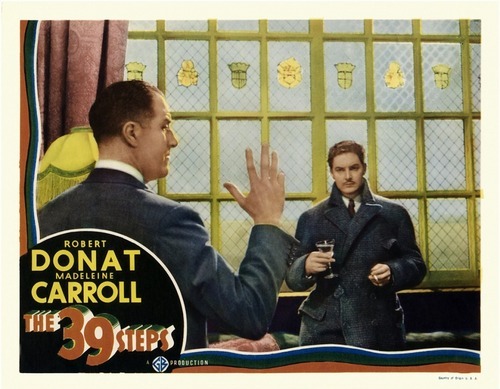 Following my recent post showing off theatrical posters for “The 39 Steps,” which you can see here, tonight we’ll look at two sets of lobby cards. If you don’t know, lobby cards were a staple of theaters for many decades, stretching back at least to the 1930s up through the 1970s. They fell out of fashion at some point, and there’s probably not much chance that they’ll ever make a comeback – these days when you go to a theater, you’ll see either posters or giant cardboard standees, but that’s about it. You can click on these to embiggen them. The black and white ones are from the original release of “The 39 Steps” in 1935, while the color ones are from a rerelease sometime in the late 1940s, I believe. As before, I found these on the Hitchcock wiki site – but I did not bother posting two-tone versions of images that were later released in full color. Like this post? Leave a comment below! And there’s still time to enter my “Talk Back and Win” contest, where you can win tickets to see “The 39 Steps” live on stage in New York City! Don’t delay – click here to enter! I can’t really disagree with Mr. Hitchcock. 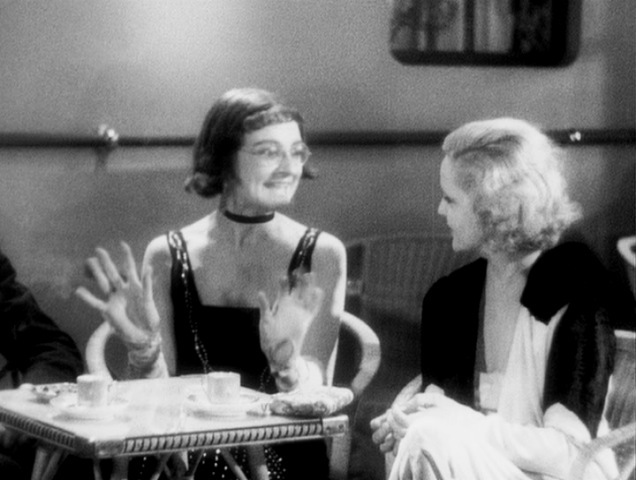 “Number 17,” released by British International Pictures in 1932, is a mess of a movie. A comedy-thriller, it actually is both funny and thrilling at times, but the real problem is the flat characters and incomprehensible plot. The story begins in comfortable territory for Hitch, as a young, well-dressed man approaches an empty house. He wanders inside, only to find a dead man and a live, but terrified, tramp. 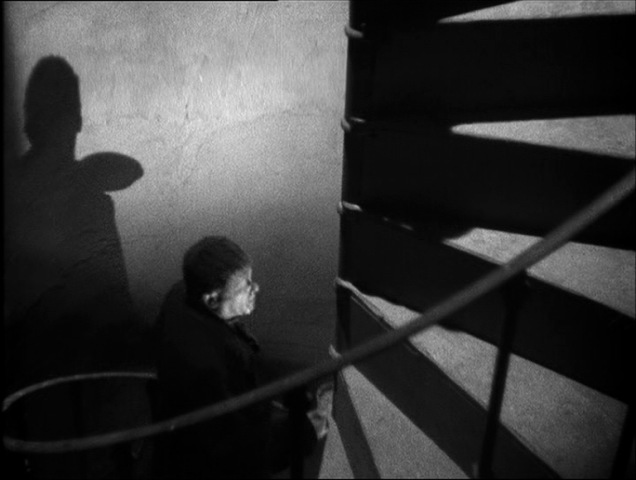 Much of the movie is set in this house, and it’s drenched in deep, often distorted, shadows, a throwback to Hitch’s early influence from German expressionist films, as previously seen in “The Lodger.” Hitch also indulges in a favorite motif: stairwells that evoke a feeling of dread. 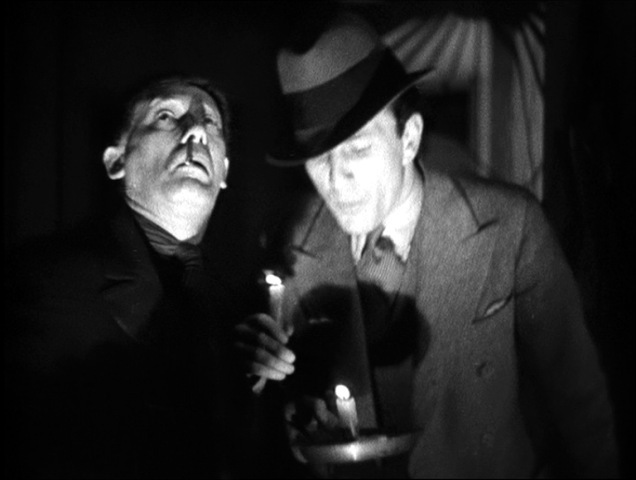 The young man is trying to find out who the dead man is and how he was killed, but before long his investigation is interrupted, first by a young woman who shows up, saying that her father asked her to keep an eye on the place, and then by a trio of shady characters claiming to want a tour of the place. The six of them wander around the house, acting nonchalant but clearly in search of something, and eventually we learn that the trio is after a stolen diamond necklace. When they recover it, they tie up the other three – but then two more people enter the picture: one is the young woman’s father, and the other seems to be the gang’s leader. The girl’s father fights the gang’s leader and loses, and is then locked in a bathroom. Meanwhile, the gang gets ready to make their escape, and in one of the picture’s more exciting moments, the girl and the young man, who have been tied to a banister, fall nearly to their deaths when the banister gives way. The pair manages to escape, and while the girl tends to her father, the young man discovers that the gang has left the house, heading for a train that will take them to a ferry and, presumably, France; for some reason, they’ve taken the tramp with them. The young man commandeers a bus, and the chase is on. There’s a lot of to-do on the train as the gang leader realizes that he’s lost the necklace; meanwhile, the bus races the train. The gang’s threats against the train crew backfires, too, and they’re left trying to run the train themselves. The train crashes into the ferry, and the gang is captured by the police. Finally, the young man is revealed to be a police detective himself. The necklace reappears – the tramp had it all along – and the movie comes to its end after a mere sixty-five minutes, all of them baffling. “Number 17” does have some great model work in the chase sequence toward the end, and there are some funny moments, particularly those featuring the tramp, but otherwise it is easily Hitch’s worst picture in his career to date. The story is that Hitch had wanted to make a different movie, but his bosses insisted he make this one instead. It would be Hitch’s final film for British International Pictures. His next picture, released by Gaumont, would be “Waltzes from Vienna,” which I will look at this weekend. Like this post? Be sure to leave a comment below! 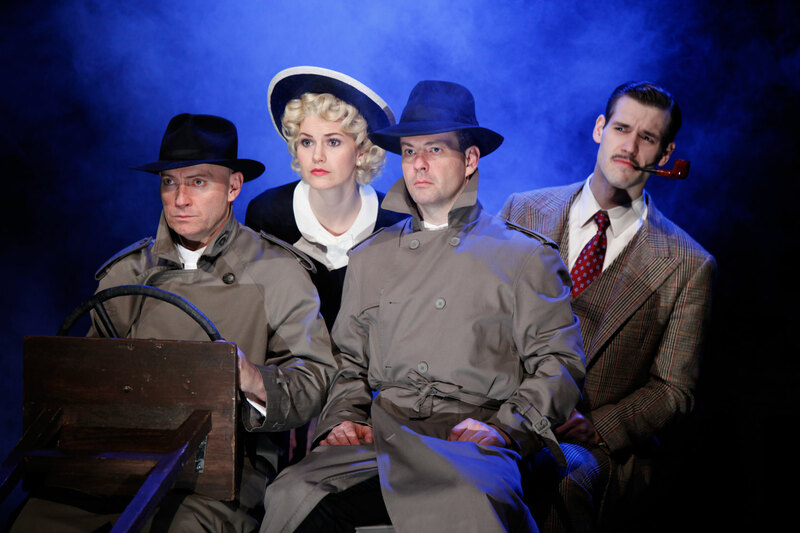 And don’t forget to Talk Back for a chance to win tickets to “The 39 Steps” live on stage in New York City right here! Talk back about your favorite Hitchcock movie for a chance to win tickets to “The 39 Steps” live in New York City! Ever since I launched “Hitchcock and Me” back in December, I’ve been telling the world about Alfred Hitchcock’s movies and what I think of each one. Now, it’s your turn! In the comments section below, tell me about your favorite Hitchcock picture – and why! 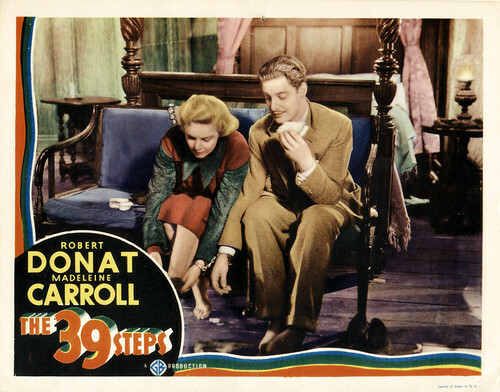 – for a chance to win two tickets to “The 39 Steps,” live at the New World Stages on West 50th Street in New York City! I’ll pick a winner in the next several days, and we’ll announce that person’s name here in a “Hitchcock and Me” blog post! The winner will be chosen by me, based on top-secret criteria known only to Hitch and me (and he ain’t talking). This is my blog, after all – so impress me! The judge’s decision is final. The winner will receive a voucher good for two tickets to “The 39 Steps” live on stage on a night of his or her own choosing. Some date restrictions apply. Winner will receive only the voucher; travel, accommodations and other expenses are not included with this prize. 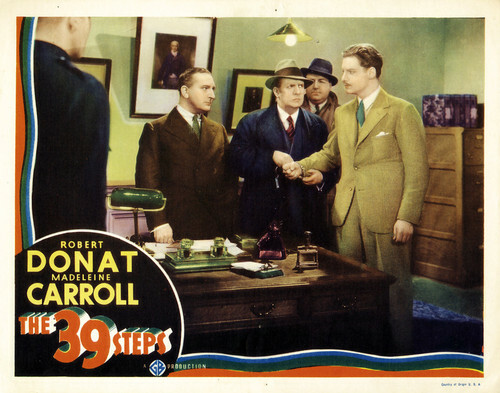 If you look to the right and down a little on this page, in the box marked “Box,” you’ll see a file called “39_Steps_06_06_071…” You can click on that to listen to one of the radio versions of “The 39 Steps” like the ones I wrote about here, or you can download it and put it on your itunes and MP3 player. I confess I don’t have much info on this version. I found it on the great site archive.org, which is a fantastic source for video and audio files, as well as documents. It’s really worth investigating – the live music archive alone is a treasure trove. This is a truncated version of the story – it only runs 40 minutes, and jumps in right at the point where Richard Hannay sees Mr. Memory in action at the Palladium. It skips over a lot of the chase, as Hannay finds his way directly from the train to the professor’s home. Still, it’s a fun listen, so I hope you dig it! It takes 39 days to hold a 39 Steps Fest – and that means we’ve got to have something new every day! Some days it’s big and important, and some days it’s something silly. Tonight, it’s an old favorite from our furry friend, Alistair Cookie, as Monsterpiece Theatre presents “The 39 Stairs,” starring cute little furry Grover. Join us, won’t you? 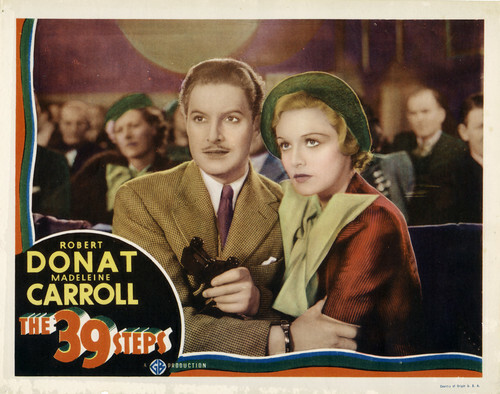 As I wrote here, “The 39 Steps” has been a classic thriller since it was first published in 1915. Alfred Hitchcock’s film adaptation changed the storyline considerably while also doing much add new life to the twenty year old tale. 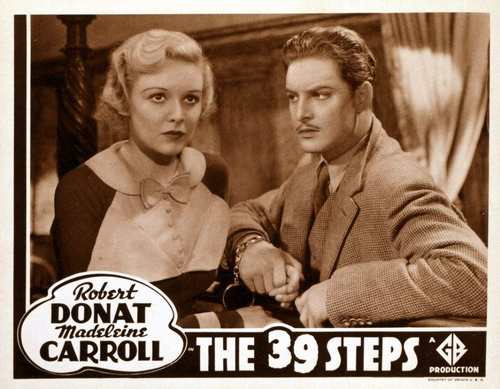 The life of “The 39 Steps” continued in another medium besides film. Like other hit movies of the perdio, it was adapted for radio, but its dual life in two popular version seems to have given it even more longevity as a subject for adaptation. According to the Hitchcock Wiki site, there have been at least ten different radio version of the tale. Here are some details on each, which I gleaned from the Hitchcock Wiki page and elsewhere. 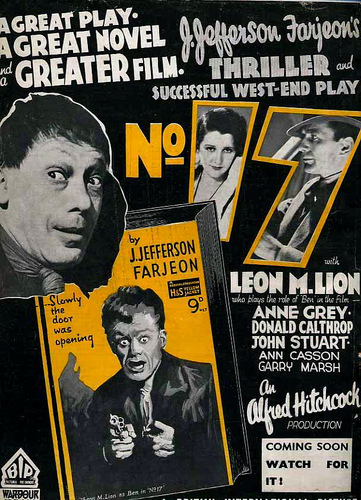 The earliest adaptation was by the Lux Radio Theatre, broadcast on December 13, 1937. It runs 60 minutes and is available on the Criterion Edition of the movie. 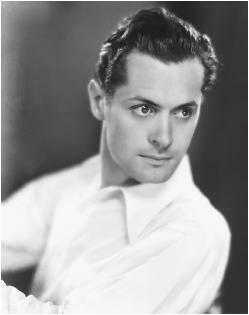 It was hosted by Cecil B. DeMille, directed by Frank Woodruff, with Robert Montgomery as Richard Hannay, with Ida Lupino as well. You can listen to it streaming here. 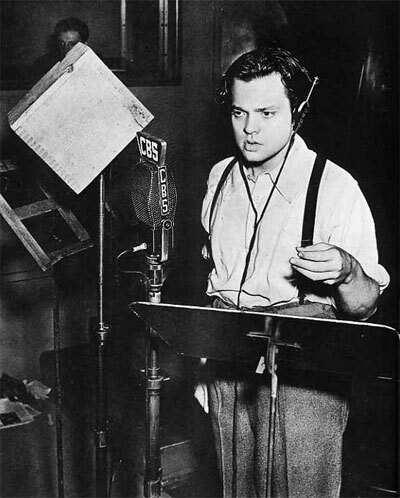 On August 1, 1938, the Mercury Theatre adapted “The 39 Steps, ” directed by Orson Welles, who also stars as Hannay. It’s one of the Mercury Theatre’s earliest adaptations, and adheres to the book rather than the movie plot; you can listen to it streaming here. It runs just over an hour, and includes a gaffe, where someone (Welles?) calls for a missing page in his script, and another at the end where the announcer’s call to cut the tape is left in. Coincidentally, the orchestra is conducted by future Hitchcock collaborator Bernard Hermann. The story was adapted again on May 21, 1943 on CBS radio as part of the “Philip Morris Playhouse” series. 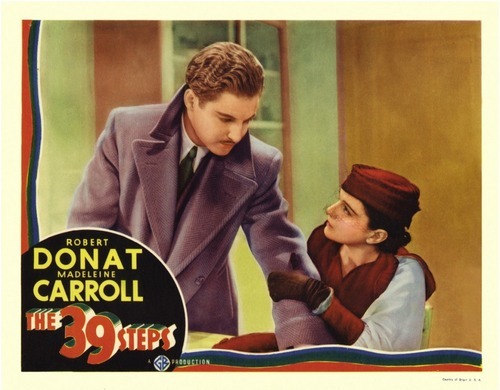 This version runs 30 minutes and features Madeleine Carroll. 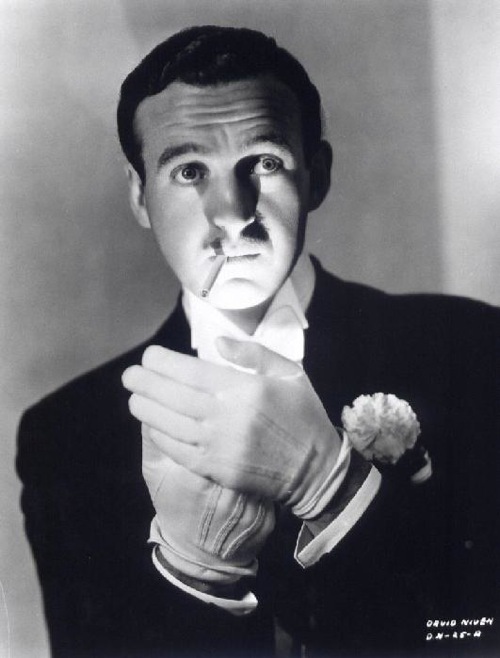 ABC radio’s “Mystery Hour” ran a 60-minute adaptation starring David Niven on September 1, 1946. The CBC in Canada ran its adaptation sometime in 1947, seven years after the death of John Buchan, who of course had been the Governor General of Canada. This version condenses some of the story and introduces a female character. It runs an hour and can be heard here. Another version was created by “Studio One” on March 23, 1948, starring Glenn Ford and Mercedes McCambridge. The next adaptation listed by the Hitchcock Wiki page ran on March 3, 1952 as part of the “Suspense” radio program. 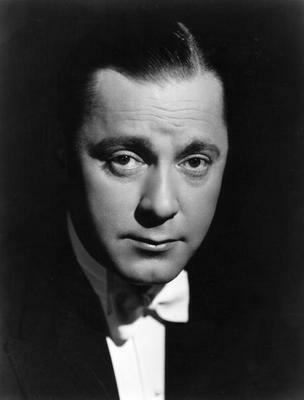 Starring Herbert Marshall as Richard Hannay, this version is based on the book, and can be heard here. 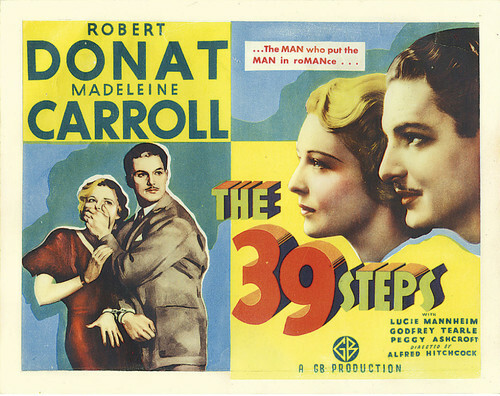 Over 30 years later, the BBC radio a new adaptation of “The 39 Steps” in three 30-minute chapters on December 28, 1989. This is a more elaborate adaptation than the previous versions, with more sound effects, music and production. You can hear all three chapters on this page. The lengthiest version yet is a straight reading of the book by James Fox. This somewhat abridged version from 1994, in eight chapters running a total of 135 minutes, is posted on the Hitchcock Wiki page here. The BBC ran a more traditional adaptation on Radio 4 starting on March 14, 2001, in four 30-minute chapters. Starring David Robb and Tom Baker, all four chapters are online here. This version seems to turn the story around a bit, so that it starts with Hannay on the run and then fills in the setup of the adventure later. All the versions I’ve posted above may be heard only via streaming audio, and require flash. In a few days I’ll post another version that’s an MP3 you can download to your itunes and put on an MP3 player. 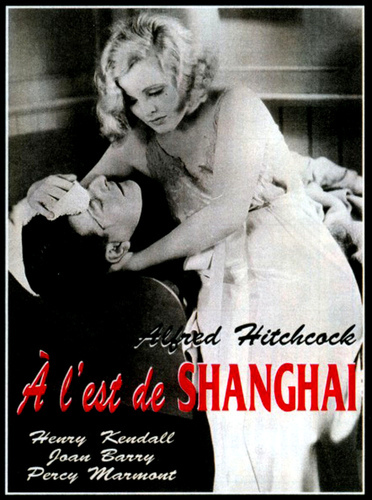 Poster for "Rich and Strange," released in some markets as "East of Shanghai"
“Rich and Strange” is Alfred Hitchcock’s second feature film of 1931 and one of only a handful of comedies he directed. The story concerns a young British couple, Fred and Emily Hill, who live a quiet life in London. Fred, however, is dissatisfied with his life; in the opening sequence we see him commuting home while dealing with a broken umbrella, a crowded subway car and fellow passengers who are annoyed by him. At home, he snaps at his young wife, who does not seem to share his discontent. He wishes for some of the finer things in life, like a sea voyage – and the mail brings him the answer to his wish, in the form of money from an uncle. The couple soon embark on a cruise, where he becomes very seasick, she meets a distinguished commodore, he meets a princess, and they begin to drift apart. But just when they’re really about to go their separate ways, the commodore mentions to Emily that the princess is a commoner, and an adventuress at that. Emily realizes that she has to help Fred, and so goes to him. He refuses to believe her, until he notices that the so-called princess has disappeared with nearly all their money. Even though the movie has been fairly funny and touching so far, it takes a few odd turns at this point, only twenty minutes or so before the end. Nearly broke, the Hills book passage back to England on a tramp steamer, then become trapped in their cabin when it begins to sink. Unable to escape, they manage to fall asleep, waking only to realize that the night has passed and the ship is still above water. They manage to escape through the porthole to a stairway, only to realize that while the ship is still afloat, it’s unsteady. sailors who let the nice white people alone, even if they do feed them cat stew for dinner. On seeing a baby on the ship, Emily begins to cry, and Fred comforts her. The scene fades, and they are suddenly back at home, Fred carping about the radio again and she snapping at him as well. 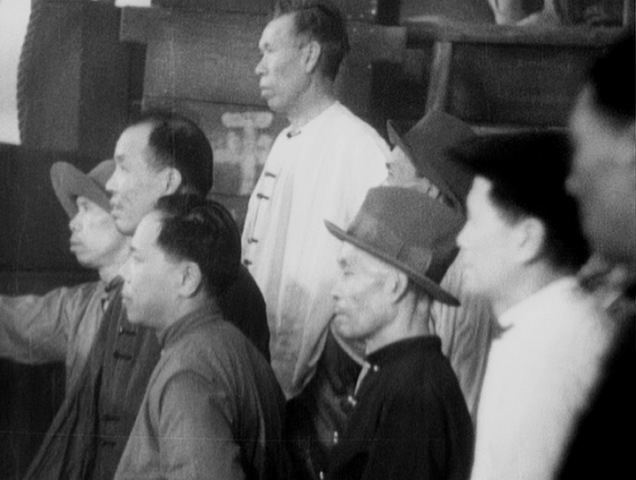 Although the Chinese junk episode and its resolution are very odd, the sequence on board the steamer shows Hitch’s dormant gift for suspense. The moments when the Hills feel the ship shifting under their feet are genuinely frightening. Nonetheless, “Rich and Strange” is another film that’s not very successful; it uses silent-movie style title cards to indicate the settings, rather than the text superimposed over the scenes, which would become the accepted way to introduce such information only a few years later. Fred is not a very pleasant character, either, and his wife seems pleasant but vapid – she never seems to care about his insensitive remarks. If nothing else, “Rich and Strange” shows that even on a substandard story, Hitchcock’s instincts and ability see him through. 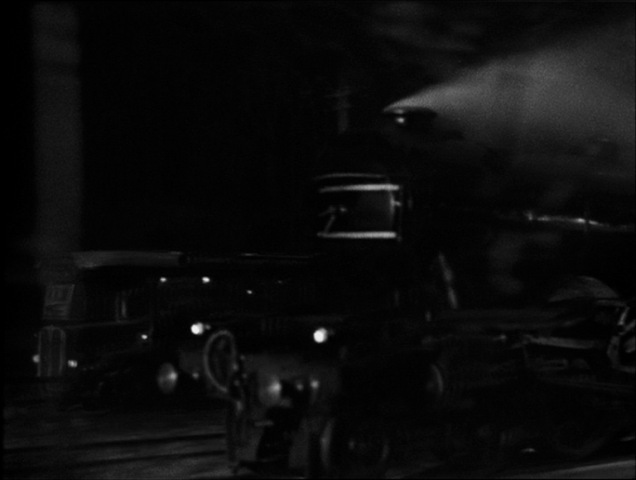 There are some fine moments of storytelling in the film, like the extended opening sequence in which Fred commutes home (although audiences at the time were put off by its lack of dialogue), and Fred’s attempts to remove the princess’s veil in order to kiss her. Also, I believe I’ve spotted a new theme for Mr. Hitchcock: the busybody spinster. There was one in “Blackmail” who hung around and gossiped; here, there’s a woman who needs to know where everyone is at all times, disrupting conversations and endangering Fred and Emily’s affairs. We’ll see if and when this theme pops up again. No Hitchcock cameo here, as expected. As I’ve mentioned before, he wouldn’t make another appearance until “The Man Who Knew Too Much” in 1934, which makes me wonder if he was too bored with this picture to bother.